Huang Rui is one of China’s most respected and controversial contemporary artists who creates two-dimensional, three-dimensional, installation, and performance works. He was a founder of the Stars Group and the 798 Art District. Born in Beijing, China in 1952, Huang is an original founder of the avantgarde art group, the “Stars,” which included artists Wang Keping, Ai Weiwei, Ma Desheng and Li Shuang and was active in from 1979 to 1983. This groundbreaking group of amateur artists was the first publicly active art collective to protest government censorship after the Cultural Revolution. Huan is considered one of the founding members of China’s contemporary art movement. In the 1990s, at a time when there were no public spaces for the display of contemporary art, he was among the few who launched the concept of apartment exhibitions. 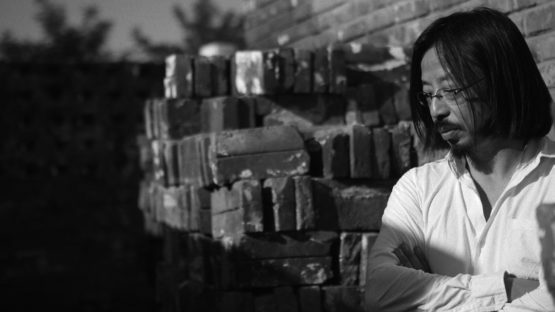 After spending 14 years in Japan, Huang Rui returned to Beijing and became one of the main initiators and advocates of the 798 Art District, which has since become the symbol of the success of contemporary art in China. Early on, Huang Rui mostly created paintings that referenced various Western artistic styles such as Expressionism, Abstract Expressionism, Fauvism and Cubism. However, as his style developed, he became more experimental and began exploring different mediums including photography, printmaking, installation art and performance art. Huang Rui’s work is characterized by symmetry and simplicity of form, as well as by the use of primary colors. His work stands alone as aesthetically pleasing; however, he is recognized as a socially minded, and thus often controversial, artist. Throughout his career, he has continued to be vocal about his belief in the importance of free expression—and as a result, he has faced a large amount of censorship from the government. It is hard to categorize Huang Rui’s art. Over the years, his work has taken on many forms. Most of them are characterized by a spirit of rebelliousness and an interest in exploring the human condition in the face of the impenetrable walls of authority. In his art, he often approaches serious issues with playful use of words. His artwork can be very symbolic, and often uses simple and direct slogans for an ironic and humorous effect. With geometric clarity and symmetry, as well as a consistent reliance on primary colors, all of Huang Rui’s pieces stand alone as objects of beauty. His body of work reflects the concerns of a highly socially engaged artist through satires of reality and references to history. Huang Rui currently lives and works in Beijing, China.